The practice of wearing a little red and white sticker originated in a staff meeting when the conversation turned to evangelism. The statement was made that “78% of people who attend a church for the first time do so because someone invites them.” Depending upon which survey you read the numbers run between 75 and 90%, but you get the picture–first time guests come to worship the first time because someone invited them…overwhelmingly. Shame on us pastors for that last one (but, none of us are perfect). If we do nothing else, we should be helping people know how to invite others to worship. It’s such an easy thing. 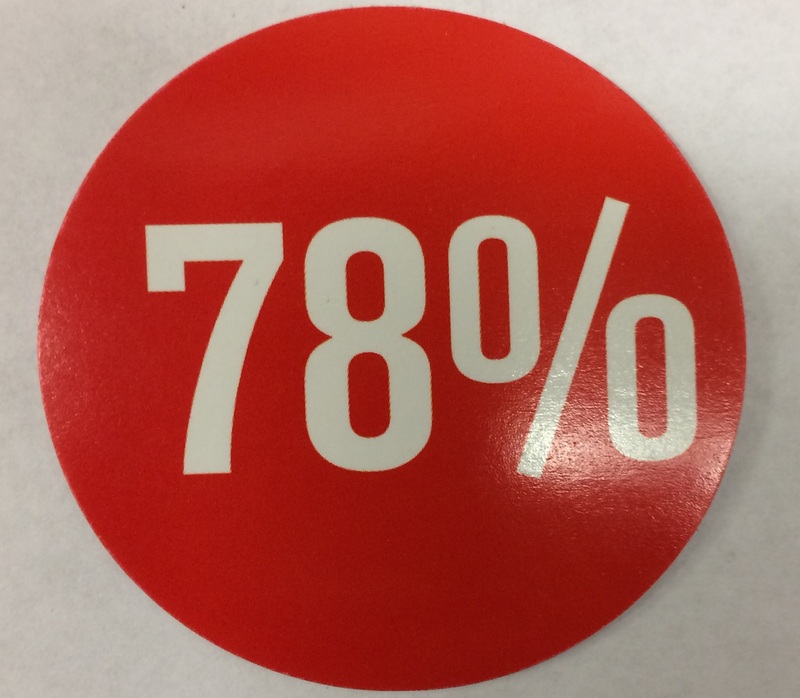 So, a little red and white sticker with the number 78 on it becomes a conversation starter. That little sticker becomes the open door to invite someone to worship. “I attend __________ church” (to which I reply, “Great! Have you invited someone to attend with you?”). It’s not really the response that matters. What matters is that I’ve had an opportunity to have a conversation I would otherwise never have had, and I can’t tell you about a couple of responses because they were private in nature (it’s surprising what people tell you when they know you’re open to a conversation about faith). Evangelism is central to growing the Kingdom of God, and evangelism is central to seeing lives transformed by the power of God. Yes, I know that inviting someone to church is not technically evangelism, but it is a first step in introducing someone to the life-changing gospel of Jesus Christ. Evangelism is foundational to becoming people of Christ (#becomingpeopleofChrist). Many of the reasons we don’t evangelize are the same reasons we don’t invite others to worship, but another reason is fear. Certainly, there is fear of rejection. None of us like rejection (I certainly don’t! ), so rather than face the rejection we simply don’t share the gospel. Another reason is we fear not having all the answers. Guess what? I don’t have all the answers, either! And, I’m a pastor! I can’t anticipate every question a person has ahead of time, and neither can you. Here’s the thing, though: Jesus never said, “Go into all the world and have your answers ready.” The Bible never suggests we should have all the answers prepared before we share the gospel. I might also add that it’s not our answers that draw anyone to Jesus. That’s the Holy Spirit’s work. All we need to know is the story of Jesus, and the story of what Jesus is doing in our life. The Gospel is power enough (Romans 1: 16). Besides, if you’re a believer, let me ask you, “Did you have all your questions answered before you believed?” No, I didn’t think so! Others won’t either. We should not let the fear of not having all the answers keep us from inviting others to experience Jesus. So, a little sticker can be a great conversation starter. All the Holy Spirit needs to change a life is a conversation. You never know…the life that gets changed might be your own.